I’m not a big fan of improv piecing like the this…I like the look of it but doing it is like doing a puzzle. I don’t like puzzles. :) I’m in awe of quilters who love (and are good at!) doing improv all the time. Luckily this one didn’t take too much figuring out to get all the blocks sewn together and spaced how I wanted them…but you can see with all those little strips here and there…it takes some planning! it came out great! and the colors are so pretty! this is so cute ! thanks for sharing . It looks great! Lovely colours too. Very neatly done! well, i love it! great job! It looks super cute!!! Way to try out improv!! It turned out great! 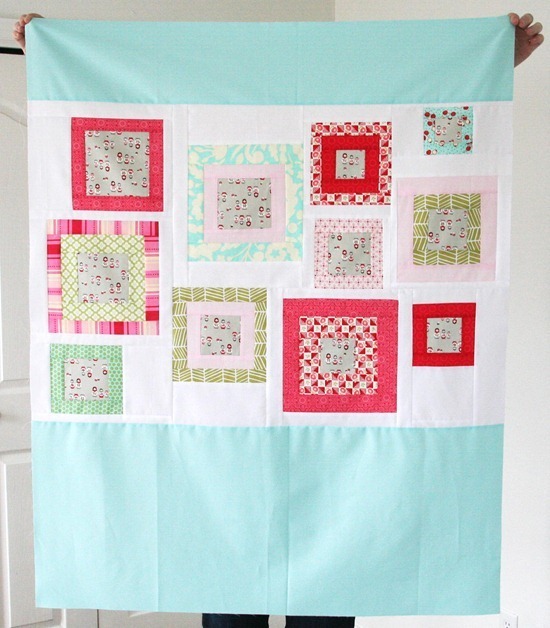 I love the quilt and the colors!! Love it, but it must really take some time in planning. Eeep, so cute! The gray fabric is perfect to showcase in the center of all those blocks. I probably work way too hard and go through way too many sheets of graph paper to get an improv look, too. Beautiful! I love the improv. look, but I haven't mustered the courage to try it yet – maybe some day! i LOVE it!!!!! it looks awesome! if you never do improv blocking (is that right?) again, at least you can say that you did it and that it turned out AMAZING!! Love it, so fresh and spring like. First of all: cute cute cute!!! But then: I totally understand how you feel. I can't even start on a project until I know exactly where I'm heading. I don't mind changing it up midway, but I can't even cut into the fabric if I can't visualize how it will fit together! Good that you challenged yourself! It looks great, the effect is very sweet. I'm a bit terrified of improv piecing myself, and I solve problems for a living!! I guess I'll just have to try my hand at it and see how it goes. That is just way cute! I love the way it turned out! 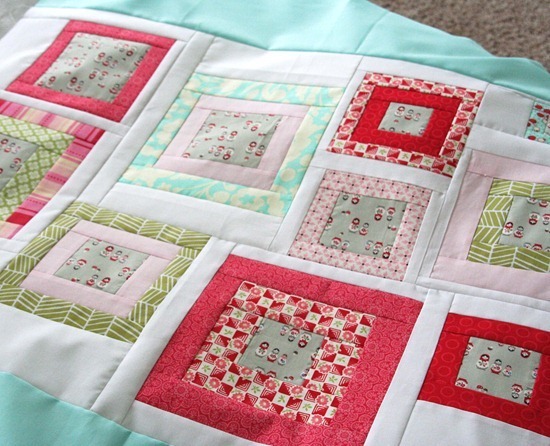 What a lovely fresh quilt! You're very creative…all the colors work and it makes me smile! So beautiful, Aunt ALLI. I LOVE IT!!! 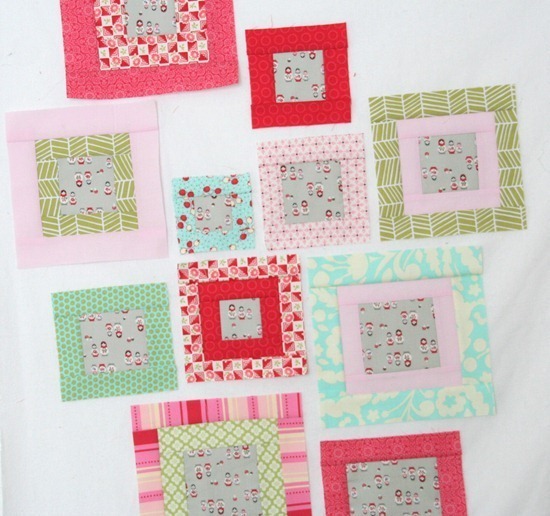 Maybe that will be my next attempt at quilting!!! Oh I just love it Allison! Great job! It looks fantastic. I am just the opposite, the more like a puzzle it is, the more I am into it and loving it too. I get bored easy when there isn't a lot of thought into how to put it together, I guess I like the challenge. Really nice. Love it..you really pulled it off. Oh my gosh, it's perfect! You did a wonderful job!! I know what you mean about the improv piecing. I have done it a couple times and it takes me FOREVER, plus I don't love the zillion seams I end up with. I love your finished product, great blocks! Oh, so lovely. I have a project that is waiting for me to stop "planning" and start cutting and sewing. This might be the motivation I needed! Thanks for sharing. You did a wonderful job! The colors, blocks everything is yummy. This is a really pretty quilt, love the modern abstract feel to it. Oh, come on. That is SO cute. Definitely looking like some fun girly stuff is getting crafted in your neck of the woods. I'm buried in a queen-sized quilt of blues and whites, so this project is such a breath of fresh air. Thanks for sharing! Awesome Job! You should make a pattern from this, I would absolutely buy it! You are the greatest….this says little baby girl all over it!